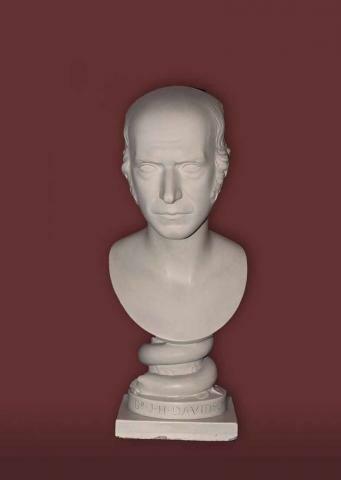 This plaster portrait bust was made in 1847 by Peter Slater. This bust offers a simple depiction of Davidson whose garments are not featured in the portrayal. This contrasts with the majority of other busts in the College’s collection where the sitter is usually depicted in classical garments or contemporary dress. A particularly striking feature of this bust is its column around which leaves and a snake are wound; indeed this is the only bust in the College’s collection to possess a decorative column. It is possible, indeed likely, that the snake is a reference to Aesculapius or his daughter Hygeia, as both of these mythological figures are associated with the medical profession and are often accompanied by a snake in artistic representations. Davidson was born in Scotland and graduated with an MD from the University of Edinburgh on 24 June 1807. Thereafter Davidson practised as a physician in Edinburgh and during the early nineteenth century he worked as one of the physicians in the New Town Dispensary. Davidson was also president of the Royal College of Physicians of Edinburgh between 1829 - 1831 and again from 1833 until 1834.